Something great happens when likeminded people come together: passion becomes palpable. Arts Umbrella has a diverse offering, and we do our best to find the right fit to create an involved and inspired community of students, instructors and partners. This is a story of all three in harmony. A creative trifecta with amazing results. Electronic Arts has been supporting the Arts Umbrella digital arts program for 15 years. Since 2001, Arts Umbrella students have had the rare opportunity to learn from EA animation and gaming industry professionals who share their knowledge and provide project mentorship as guest instructors. The Electronic Arts Teen Animation Scholarship Program provides full scholarships for teen artists aged 14 to 19, and these scholarships change lives. Not only does the program have amazing support, but it also has an inspired instructor who believes the content is having more of an impact than ever anticipated. Tarek Elaydi, who has taught the class for 5 years, explains that "This year the average age of the students is 15 which is remarkable in itself. By starting this early, these students will establish a much stronger foundation in digital media and be able to create mature work before graduating high school." Elaydi believes the class is giving kids an edge in digital media, and that the proof is in those who have gone on to University Art programs. Proof also comes in the form of success stories like that of student Roan Shankaruk, a 15 year old girl from Vancouver. Roan is a spirited young artist who has many stories to tell. "Life is never boring when there is so much beauty around you and you feel constantly excited by all the colour and texture and possibilities". Her passion for storytelling, imagining adventures, and creating characters was the perfect fit for the EA program and her exploration of digital arts at Arts Umbrella has led to great things. 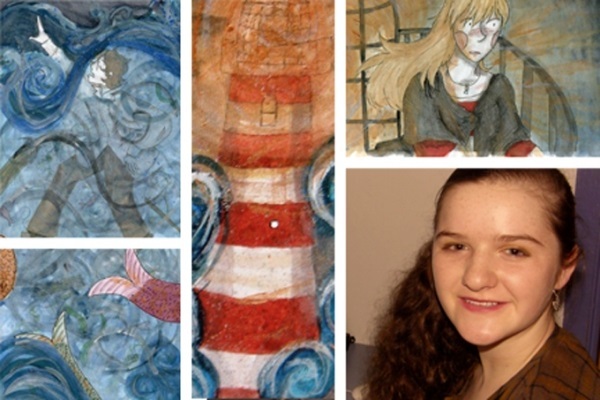 Recently, she received honourable mention in the Youth By Youth Cinema competition at the 2012 Calgary International Film Festival for her animated film "O Sinking Ship", a piece created as part of last year's Electronic Arts Teen Animation Scholarship program. Electronic Arts, Tarek and Roan have each had a profound impact on this program in very unique ways, but their underlying connection to digital arts is clear. This has been a story of passionate people coming together to do great things. We encourage you to find your passion and create your own success stories; we're doing just that each day here at Arts Umbrella. Check out "O Sinking Ship" by Roan Shankaruk below!